As a mother of two younglings, I always try to feed my family with healthy food. For this, I’ve tried different types of cooking method and find that grilled food is healthier than others as you don’t need to use excessive oil. But it is difficult to have grilled food each time of the day using a grill. But you can use a grill pan to have grilled food right from your kitchen without using a regular grill. You can also surprise your guests by serving the amazing sauce from the juice of your grilled food. And the most interesting thing is it can cook your food faster than a traditional grill. So do you want to taste amazing grilled steak or veggies without spending so much money on a traditional grill? A good quality grill pan is the only alternative to have grilled food. But it would be better if have the proper information about grill pans before buying. In this guideline, you’ll find almost all of them. So let’s dig in! Put marks on your steak on the burner, put in the oven to complete cooking then leave the pan in the dishwasher after use. Yes, cooking is that simple and comfortable with 630-30 grill pan from Cuisinart. This pan is large enough to house 6 chicken breasts at once and small enough to fit in the oven. It is non sticky, but you don’t need to bother about what spatula to used to flip the burger-wooden or steel or silicone during rush. This grill pan is compatible to anything. It is made as dishwasher safe, I prefer hand wash though. Because, no one wants to take any risk about this beloved grill. You want it to last long and perform great for you. The ridges are not bold, leaves faint grill marks on food but the good thing about it is, you can cook sauce in it after draining the grease. It does not have any pour spouts yet the draining is non dripping. Cast iron pans never get out of fashion due to their durability and endless performance. This square pan from Lodge is pre seasoned; that means you will need ‘little seasoning’ before use. Many people misunderstand this term as ‘no need for seasoning’. 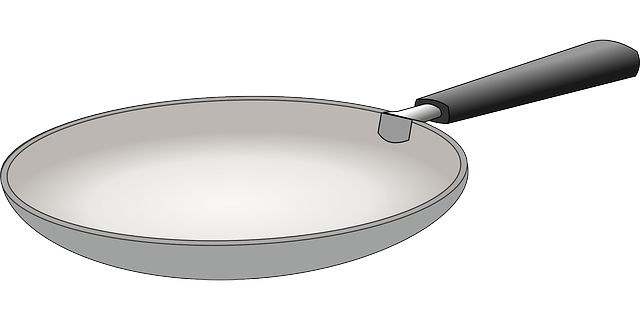 It’s 10.5 inches width may seem smaller but the square shape makes the surface area larger compared to circular pans of 12 inches. The ridges are deep enough to make dark grill marks on you food and keeps them above the grease. There are loops to hang the pan if you seem storing it eats up space in your cabinet. Cast iron heats up slowly but gets burning hot once heated up. 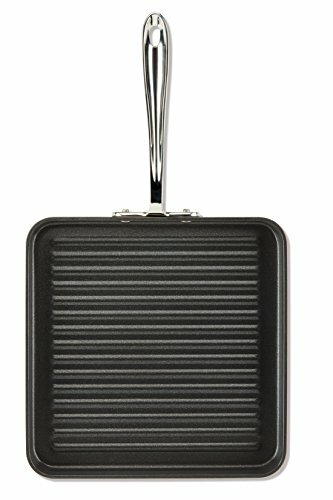 You can cook versatile style with this grill pan if you know how to deal with the heat of cast irons. It may seem hard to clean; but you can scrap this with anything to get the mess out of it, without worrying about scratches. This pan costs little but can be used over generations for its unbreakable characteristics. Season often for easy release. By the look of this pan you can say it looks different. It really is different but not only because of its looks, but also for its construction, functionality and performance as well. It has five layers of non stick plate with insulation in between. Hence, it holds heat perfectly compared to other non stick pans. This pan lets you grill any fatty meat on it but saves you from consuming the unhealthy grease. It has self draining system that removes grease from food during the time of cooking. Your food will not float on its own grease and you won’t need to pour the grease after cooking each batch. These qualities make this pan a must have for every fitness freak. Its 12 inches non stick surface keeps it new for years. The print and engraving on it is very decorative but may not give you conventional grilling mark on your food. However, its efficiency and affordability beats that lacking. 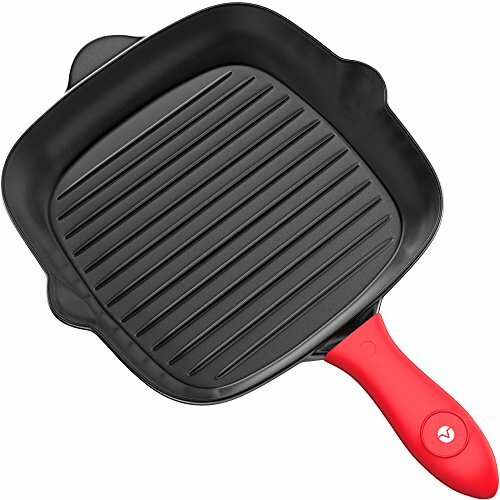 Staub launched this 12 inches grill pan for users who never hesitate to invest on quality products. You may never find any cast iron pan which can pass the ‘high end’ mark with the finish. This pre seasoned pan has a perfect finish on top and an enamel coating on bottom, making it suitable for glass top stoves. The ridges on the surface are high enough to keep the unwanted grease far from your patty, forming an admirable mark while sealing the juice and tenderness inside. Pouring spouts on both sides are convenient to drain grease. This pan is suitable to cook small roast in the oven and clean in the dishwasher. The loop on the handle is meant for hanging up. The excessive price and weight are the only drawbacks of this heavy duty grill pan. You may never miss cooking on a smoker after seeing its performance on your stove. All-Clad is a popular brand among cooking enthusiastic for their quality cookware within affordable price range. 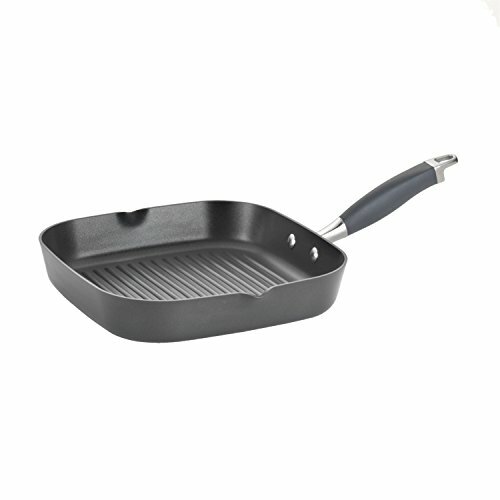 This non stick grill has similar characteristics as cast iron due to its hard anodized construction. It heats up fast and spreads it evenly. Its 11 inches square shape should suit your requirements if you find 10 inches pan has little room for your food to cook at once and 12 inches is too big for your stove. it’s ridges are deep to put defined mark on your food and has high sides are convenient not to splatter. You may find many grill pans in the market with similar qualities but the handles of those may not be as comfortable as All-Clad grill pan. The handle has stainless steel body and slightly contoured at the end so that you can have a secured grip on it. Cleaning this pan is a breeze. You can remove the food and grease just only running water. Using mild dish-washing liquid is enough to remove the oiliness afterwards. It is made dishwasher safe but hand wash is preferred for longevity. The only thing that does not match with the advertisement is, this pan is not compatible to inductions. Handle is good to grip on. Not suitable for inductions as advertised. 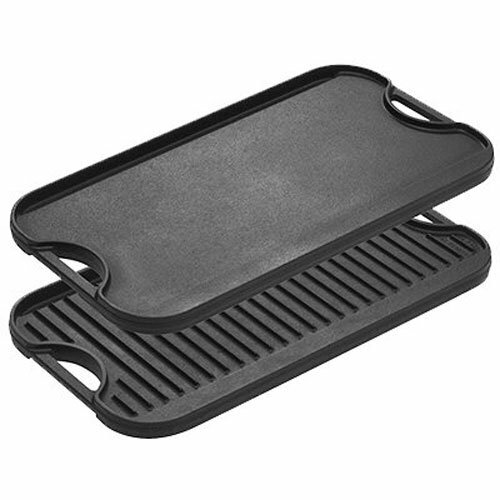 This grill pan from Anolon lets you get all the advantage of a non stick grill pan without dealing with heavyweight. Besides, like its inner surface, the outer surface is also non sticky, making this pan easy to clean inside and out. Unlike other pans its handle has a rubber padding. The handle won’t slip off your hand even if you are sweating and ensures a comfortable grip. This pan is oven proof up-to 400 degrees. Never forget to use your oven mitt to take the pan out of your oven, because the handle gets excessively hot. Its sides are deeper than other pans and useful if you grilling fatty food in it which tend to splatter a lot. The ridges are low; food will not look or taste like BBQ. The bright side of lower ridges is, you can make mouth watering gravy in it using the juice from cooked chicken breast or vegetables. The unique feature of this pan is, it is rectangular shaped and the ridges is diagonal. Whether you put the food length or width wise, it gets diagonal grill marks every time. It is 12 inches long and 9 inches wide making it roomy enough to hold larger food whilst takes smaller space to store. It has 3 layers of non stick coating on anodized aluminum body. The aluminum makes its construction durable while the multiple layers make the coating long lasting. It is perfect for searing, grilling and roasting, because it is oven proof to make nice juicy roasts after marking on the meat. The manufacturer offers lifetime warranty of every parts of this pan. This pan is a bit pricey; twice the price of other pans. However, its 2 in 1 functionality should not restrain you from buying it. It is a perfect pan to make panini sandwiches, as it comes with a heavy press. 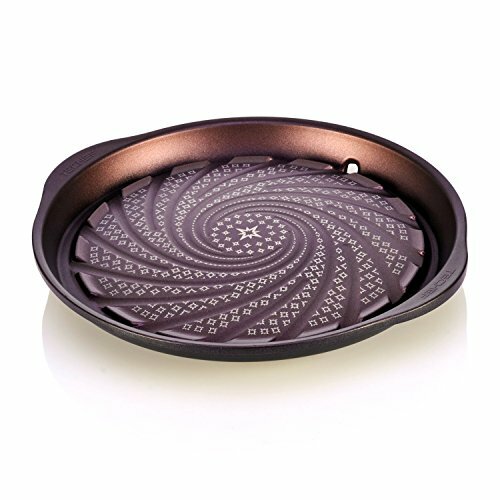 This pan lets you experiment with your sandwiches by mixing and matching different combinations of filling. This cast iron pan is large and reversible. That means, when you need grilling, the grill side will work twice the capacity of regular pan; griddle side does the same. With this pan, you can cook two to three types of food at once to complete a decent meal or cook massive amount for a crowd. You have to set this up on your two stove top burners to get all the advantages, but not necessarily use the both burners. You can cook on one side and leave cooked food on the other to keep warm for longer. It is pre seasoned with vegetable oil, so cooking and cleaning is easy with no mess. You even have the freedom not to use any soap on it after cooking to keep it seasoned. to learn its full functionality and to get use to it. May take time to get used to with it. This cast iron grill pan from Vremi can be a considerable option if you are looking for something durable within economic range. This 11 inches pan is the cheapest on this list but has the functionality of pricey pans of popular products. pre seasoning makes it as good as non stick pan it terms of food release. It is compatible to cook on gas, electric and glass top burners. It has deep rim on the border with pour spouts. A red rubber cover for handle comes with it within this price. Only drawback I found is, it’s too shallow ridged makes it less suitable to grill fatty pieces of meat. Your burger may soak on its own fat while grilling on this pan. It is more suitable for cooking vegetable, fish, chicken and lean meats. It is oven safe up to 480 degrees but not meant for dishwashers. Nevertheless, washing this pan with hands will not be hectic, as food won’t stick on it. Not everyone has the same requirements when it comes to the size of kitchen utensils. This 9.25 inches square pan is adequate it you are living away from home or you have a small family. This pan is cast iron made yet, it is modern looking. 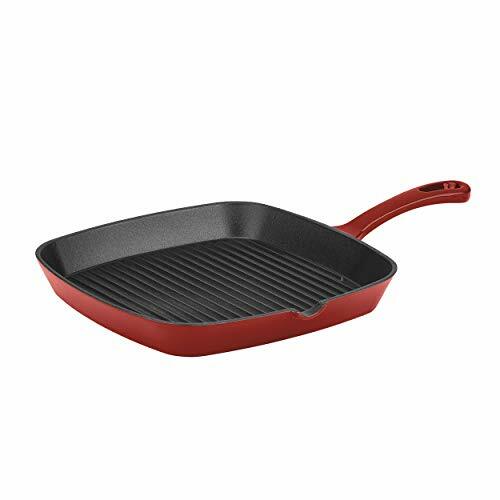 The porcelain enameled interior and the bright red exterior makes this pan looking beautiful and exceptional compared to other cast iron pans. One pour spout is made on one side but he sides are not too high to protect from splattering. Besides, i assume the enamel coating makes this pan less suitable to deal with high heat. It is made oven proof though. And dishwasher safe as well. The handle is cast iron made, so be careful holding the pan while it is still hot. There is a hole on the handle to hang the pan after cleaning. The price seemed a bit higher to me, but the weight proves its durability. You can also use Best stone frying pan. Enamel coating may not be long lasting. 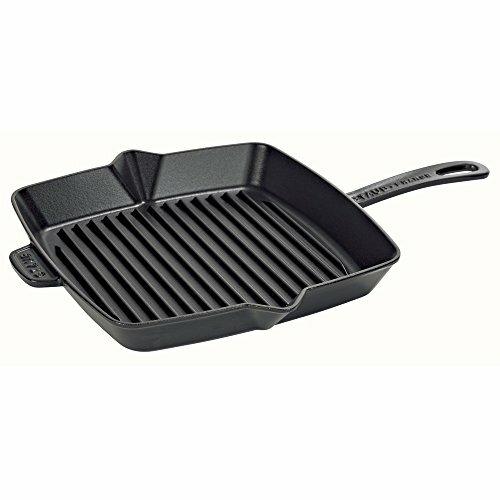 Grill pan is a kind of frying pan with raised edges grill lines. These grill lines are spaced about 1- 2 c.m. apart and raised up to 0.5 cm high. So they allow food juices to drip down while cooking. 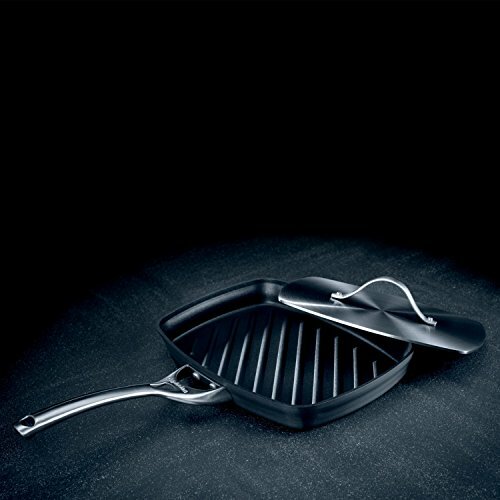 To cook your food evenly, the grill pan is designed with the best heating technology. Grill pans are sometimes known as ‘Griddle Pan’ and ‘Broiler Pan’ in US & Canada. Most grill pans are made with non- stick surface, but you’ll find pans made with other materials. We all love a steak with nice and solid grill marks which we can get only at the outdoor grill or in the restaurant. But using a grill pan we can taste same at indoor. Usually grill pans come in round and square shape. Both of them allow you to cook meat and vegetables at the same time. 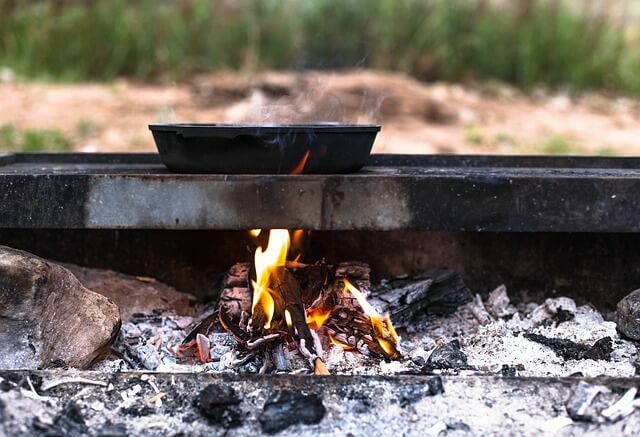 The edges of a grill pan collect juices from the food which you can use to make a sauce for steak, fish or gravy. A grill pan for steak can be used in indoor cooking. You can enjoy a steak without going outside. Using a grill pan is quite easy. But the following few tips and tricks can make your food even better. Preparing properly your food ensures that it’ll cook evenly. You can pound or cut the food into pieces so they remain flat on the surface. Turn your stove to medium-high heat and place your grill pan for 5- 20 minutes (time depends on the type of stove you’re using). To check the heat, put few drops of water on it. 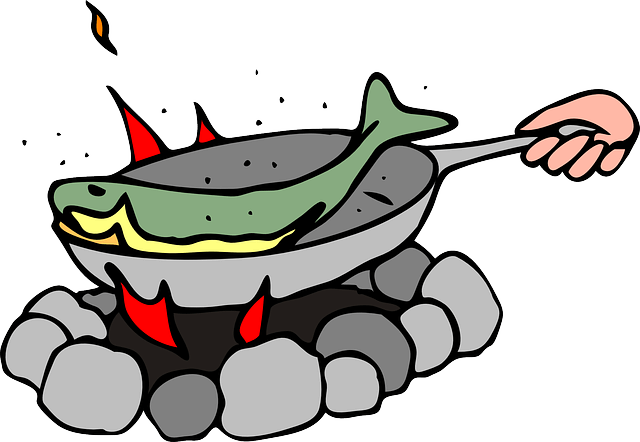 If the water evaporates right away, it is hot enough to cook. Greasing your pan before cooking will prevent your food from sticking to it. You can use spray or paper towel to grease the pan. When everything is ready just put the food directly on the grill pan and cook. If you want square grill mark on your food, rotate the food by 90 degree before flipping. When one side is done flip the food and repeat the method. This type of grill pans are most popular for their durability, heat retention and excellent cooking. Stainless steel pans are lightweight, long lasting and rust resistant. The only drawback of this type of pan is they are not good at heat retention. Aluminium pans are also light, rust and corrosion resistant, heats fast and easy to maintain. But heat retention is not like the cast iron. So a grill pan can help you to cook amazing food at home. You don’t even need a regular grill to tase the grill food. But there are few things you need to consider before buying a grill pan for your induction or glass cooktop. Pick a grill pan with appropriate length handle. Because a short handle may burn your hand or fingers and a grill with excessive long handle will increase the weight. Construction material is the most important thing to look for while buying any cookware. The most common materials to make grill pans are cast iron, stainless steel and aluminum. You must know about the features of each material before buying. The cooking surface of a cast iron grill pan can be pre-seasoned or coated with enamel. Pre Seasoned pans are long lasting and enamel coated pans are easy to clean. Whereas, stainless steel grill pans are not coated so they are not easy to clean and can burn the oil. If you are buying a pan, must pick the one which is easy to clean and have non- stick coating. Though the shape of the pan isn’t so crucial, it’s totally up to you which one you choose. But a square shape pans are larger than a round shaped one. Size is another important thing you should consider while buying a grill pan. You need a smaller pan if you are cooking for a small family of 1-2 person. You need a big one if you need to cook for more people. Check the durability of the ridges or grates of the grill pan before buying. In this case, cast iron pans can grasp a lot of heat and distribute them evenly into the food and leave beautiful grill marks on the food. Drain the excess grease into another container or trash. To clean the gunk, add a bit of warm water and a handful of salt. You can also use soapy water to clean your pan. Scrub the pan with a nylon brush. Rinse the grill pan with hot water using the scrub. Now pat your grill dry. You can put it on the stove on a low heat, it’ll prevent your grill from getting rust. If you are using a cast iron grill pan, you need to reestablish the seasoning by brushing some oil on the surface. I know it is difficult to choose one grill pan among so many varieties available in the market. So I’ve listed 10 best grill pans and tried to highlight on every single detail you need to know from my own experience. Each of these pans made to meet different needs of different customers. You can match them with your needs and pick the one suits best. Once you get the right one for you, you can enjoy grilled food from your kitchen with a little bit of preparation. InAPics.com is a participant in the Amazon Services LLC Associates Program, an affiliate advertising program designed to provide a means for sites to earn advertising fees by advertising and linking to Amazon.com. Amazon and the Amazon logo are trademarks of Amazon.com, Inc, or its affiliates.